Eating on auto pilot (i.e. eating snacks while surfing the Internet, eating while watching a favorite TV show, or having a pastry with coffee every morning) is a sure fire way to sabotage even the best laid weight loss plans. Here’s how to take control of your weight loss plan, before or after a Bakersfield medical weight loss program. Sit at the kitchen or dining room table. With today’s busy schedules, people tend to eat on the run, catch up on their reading, or even watch a favorite show while eating. However, that often means you’re not in control of your eating — your activity is. Developing a habit of eating while sitting at the table may help you to not only alter how much you eat, but how often. Avoid eating visuals. For instance, if walking by the company vending machine, makes you think of salty chips, go out of your way to avoid passing by. Eat and only eat. Make eating your sole focus. 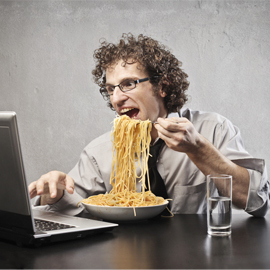 Don’t read, watch television or surf the Internet while eating. Implement the 15 minute rule. As soon as you get the “signal” that you are hungry, train yourself to delay eating for 15 minutes. Why does this help? It will break your automatic brain response to associate hunger with immediate food. Re-train your food eating techniques. For instance, if you always eat with your right hand, try holding the fork or spoon in your left hand. Again, the whole idea to help with our weight loss goals is to take yourself off of autopilot and think about eating — both why and how.